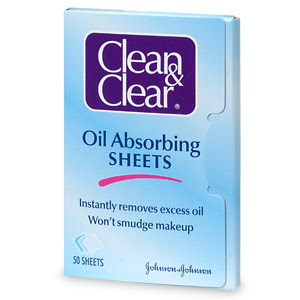 These oil absorbing "sheets" from Clean and Clear are some of my favorites for a few reasons - affordability and effectiveness. At just under $6 for 50 sheets, they're a more affordable option than some others on the market that sell for up to $20! Yikes! These are also really effective - one sheet can take care of sheen on the whole face, completely absorbing oil and keeping makeup in place. The only thing I don't love about these is that they are not made of natural fibers, so aren't biodegradable. But you'll be using a lot less than with blotting papers, so there will be less waste in the end. These are also really easy to find - pick them up at any local drugstore or superstore, or at www.dermstore.com. These oil absorbing tissues are great two-in-one products - they combine oil absorbing rice paper and mattifying powder in one easy product. I always have these in my kit and my purse to keep my skin looking fresh. One side is just paper, and should be used first to absorb excess oil. The other side has translucent powder or colored powder (I prefer the translucent - it works on all skin colors) that helps to set and refresh makeup. 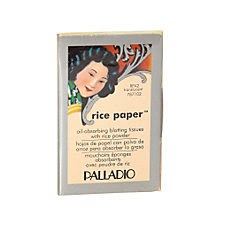 These are also great because they are thick, strong rice paper, so they are very absorbent and sturdy. They can be found at Sally's and Ulta locations, and online. If you're in a pinch and don't have blotting papers on hand, you can use toilet seat covers or event toilet paper. Just press and roll off the skin to absorb excess oil. What are you tricks for fresh summer skin?